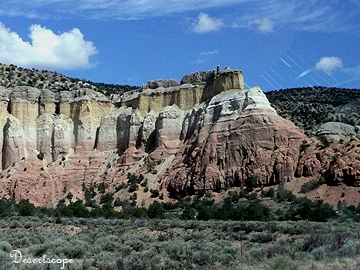 Directions: Follow US highway 84, 17 miles NW of city of Abiquiu, and about 4 mile north of Ghost Ranch. 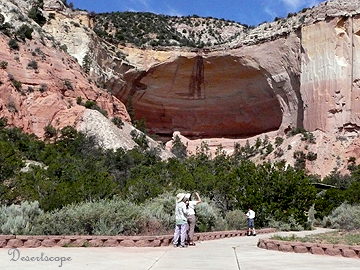 The Ampitheater is on the bottom of the red sandstone cliff. 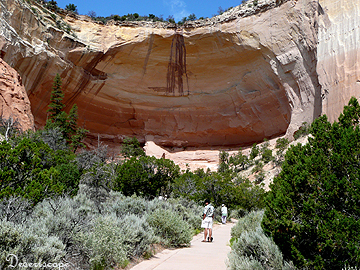 Echo Amphitheater is a part of Carson National Forest Service. At the entrance, visitors can park their cars on the paved parking lot. There are picnic tables and campground along the area. Here the red sandstone formation formed a semi-circle around the area. The short hiking trail curves around the ground and ended at the center of the naturally formed Amphitheater, a giant hollowed semi-doom that resonates sounds within. The place was hot and dry during my July visit, probably not suited for camping at this time of year (as witnessed by the vacant campground), but the rich color of sandstone, the majestic beauty and enormous size of the amphitheater itself, along with the opportunities to see various song birds nested along the ridge made the site really worth visiting.